Imagine being able to continue visual examination of the Holy Shroud of Turin long after it has been returned to its safekeeping. That, and much more, is possible with 3D laser holograms. Currently, the Shroud of Turin is a limited resource for scientists in that access for physical examination is heavily restricted. Visual examination relies on traditional photographic documentation. I propose that the non-destructive recording of laser 3D holograms of linen fibers could provide an opportunity to break this long-held scientific and technological investigative barrier. (above): The Holy Shroud of Turin (anterior). What is the Shroud of Turin or Holy Shroud? I would suggest that you access the vast amount of Shroud information online for its history. The Shroud of Turin (Holy Shroud) is an ancient linen cloth that measures 14'3" long (4.36m long and 1.10m wide). It contains an "image" of a man who has been beaten and crucified. It contains both the anterior (front) and posterior (back) images. Therefore, it is believed that the man was laid upon the cloth, and then the cloth was folded over him. The image is recorded onto only the top surface of each fiber, with a depth of approx. 0.02 - 0.06 micron. It is believed by proponents to be the burial cloth of Jesus Christ and a physical testament / record of his crucifixion and resurrection. It is believed by opponents to be a forgery, with various dates and methods of creation. Whether or not you believe that the Shroud of Turin is the actual burial cloth of Jesus Christ, it remains the most scientifically studied artifact in world history. 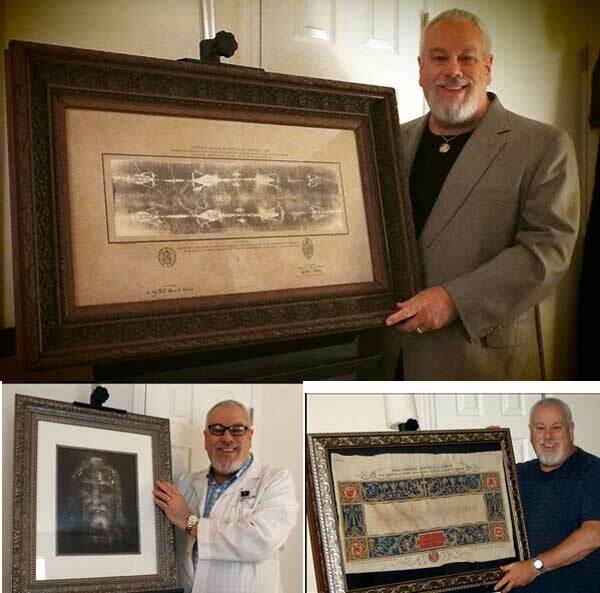 (above): I also bring and exhibit very rare Shroud of Turin artifacts with my presentation. Shown here is an authentic, original Shroud of Turin photograph taken by Secondo Pia in 1898 (top), a life-size 3D computer generated lenticular photograph of the face in the Shroud (bottom, left), and a commemorative fabric (only 100 made) which was touched to the Shroud during its 1898 exhibition in Turin, Italy (bottom, right). Each is an extraordinary artifact in the history of the Shroud of Turin. Holography is a Nobel prize-winning field of optical physics (Dennis Gabor, 1971). Unlike other 3D stereographic technologies that have preceded it, holography provides true 3-dimensional SPATIAL imaging. In other words, the recorded object has true three dimensions in space, not just a visual representation of 3D from 2D sources. It is also the highest resolution imaging technology in the world today. Holographic emulsions, whether silver-halide or photopolymer, support up to 10,000 lines/mm of resolving power. This does not mean that the holographic information is recorded via "lines", as is reported elsewhere on the Internet. The information is actually recorded spatially throughout whatever media is used. I have had 35+ years working with lasers and holograms in my holography studio / lab in Allentown, Pennsylvania, USA. I first experienced holography in 1968 at Edmund Scientific in Barrington, New Jersey. I am now retired, but still active giving presentations. I now live in our retirement residence and no longer have my original lab. However in 2018 I have had a donation of a portable holography system that now permits me to remain active making holograms. To give credit where credit is due, this is not the first time that holography / holograms have been applied to Shroud research. 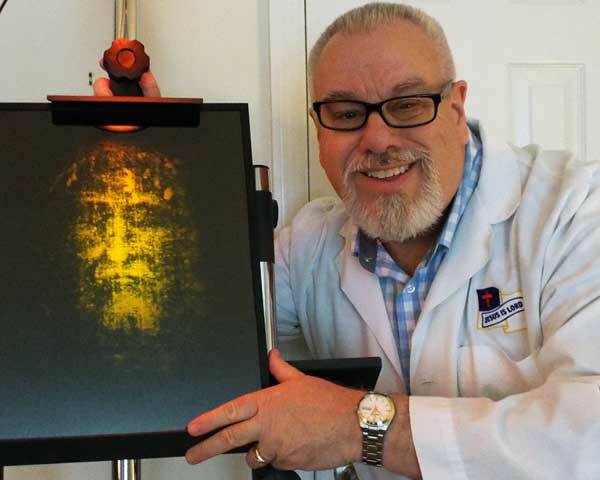 Within the past decade, there have been other holograms made, most notably the famous "Face in the Shroud", produced by my friend in holography, Dr. Walter Speirings, founder of Dutch Holographic Laboratories. I own one of his famous, large-format glass-plate, computer-generated Face in the Shroud holograms with me here in the United States (and include it when I give presentations). However, these are display holograms: projects primarily for showcasing the dimensional properties embedded into the image in the shroud. They do not provide the ability to examine the fibers of the cloth itself under high powered microscopes in three dimensions ... primarily from them originating from the photographs, rather than the physical Shroud itself. 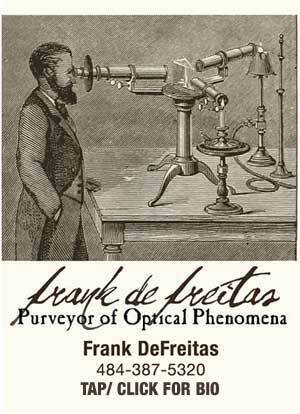 (above): Frank DeFreitas with the Face in the Shroud hologram produced at Dutch Holographic Laboratories under the direction of Dr. Walter Speirings, and his amazing holo printer. It is the only true SPATIAL rendition of the Shroud that occupies a true volume of space. ALL other techniques and resulting imagery up until this hologram provide only a *representation* of 3D. Any 2D image can be made into a *simulated* 3D image with modern technology. The difference with holography is that it provides REAL dimension in REAL space. One of the advantages of a true hologram is depth of field (parallax is another). One will never detect depth of field in ANY 3D movie or photo: lenticular, anaglyph, stereograph, View-Master, et al. With a hologram, if something is recorded in the distance it functions as if it were really in the distance. If you wear glasses for distance vision, and you take your glasses off, the object far off in the hologram will blur ... just as it would if it were physically there. That -- T-H-A-T -- is the DIFFERENCE between holograms and the simulated 3D of ALL OTHER METHODS. UPDATE FOR 2019: Utilizing a newly obtained transmission and reflection densitometer, I can now demonstrate LIVE and in REAL TIME the process of extracting the 3-dimensional information from the Shroud of Turin. Many of the so-called "holograms" of the 3D Shroud face that one finds so inexpensively on various web sites are not holograms at all. By far and wide, the vast majority of these 3D images are actually what are technically known as lenticulars, or another method resulting in anaglyphs. This error is so common as to be nearly universal. Holographers have been trying to bring this charade to an end for years. Images must be created through the specific technique of holography, which is a Nobel prize-winning field, to be referred to as a hologram. If they are not ... then they are not holograms. In the year 1978, many scientists and technicians were granted unprecedented access to the Shroud of Turin for examination. 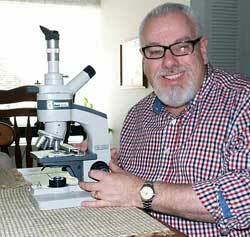 Microscopic examination was made in situ. I have not yet obtained confirmation on whether this examination was 3D stereoscopic, or even if 3D stereoscopic micro photography took place. 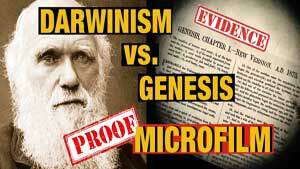 Therefore, I am assuming that all microscopic examination, and micro photography, if any, was in standard 2D. (left photo): Holograms can be reconstructed and viewed through standard as well as stereoscopic microscopes. The object(s) recorded can be examined as if the actual object were present. With a stereo microscope, the holographic objects are viewed as 3D. At the time, technology for recording holograms would have been much too cumbersome. Large, heavy vibration isolation tables, lasers and optics were the norm in 1978 (My own holography optics table weighed 1.5 tons in 1983). However, if holograms had been recorded, scientists today would have just as much microscopic access to the Shroud as had taken place back then. Today, diode laser holography has made recording equipment lightweight, fast, and compared to older, silver-halide media, the newer photopolymers do not require any darkroom chemical processing. With my linen cloth prototype, since my recording is a true, 3D laser hologram, the image of the fibers would remain three dimensional -- just as if they were there again. The holographic recordings can then be duplicated, and sent to researchers around the world -- without the Shroud ever leaving its protective storage. Thousands of holograms could go to thousands of researchers, all at the same time, without regard to geographic location. I do not have access to the Shroud of Turin, so I have utilized a similar piece of herringbone linen for my holograms. 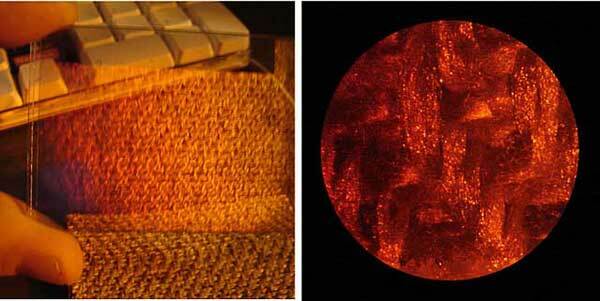 For my microscope holograms, I utilized a similar piece of herringbone linen to that of the Shroud of Turin. I have demonstrated in the past that it is possible to record 3D laser holograms on thin-film photopolymer emulsion, then reconstruct the holograms for viewing under high-power 3D stereoscopic microscopes. This gives the same result to the observer as the object physically being there: it can be examined with just as much authority as the "real thing". (left): Photopolymer hologram of the herringbone linen; (right): Right eye view of hologram under 3D stereo microscope. 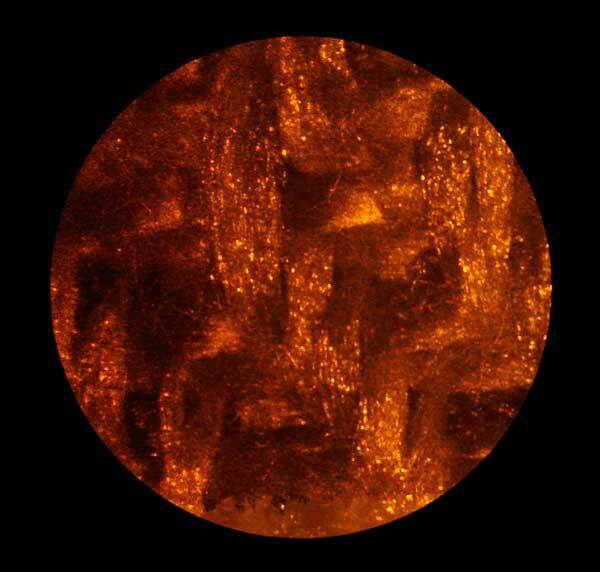 As was predicted, the 3D laser holographic (hologram) image of the linen sample appeared just as the actual physical linen would when placed under any 3D stereo microscope. Each individual fiber was clearly discernible. If this hologram were made of the actual Shroud threads, any scientific laboratory anywhere in the world would be able to visually examine it. Being easily duplicated once created, many laboratories would have "access" to 3D stereoscopic visual examination of the Shroud of Turin. Detail: Right eye view of HOLOGRAPHIC IMAGE through 3D stereo microscope eyepiece. I will create a 3D anaglyph for posting on this web page after my Fall 2017 tour is completed. What is real? What is a hologram? 3D stereo Aomekie microscope showing the Shroud of Turin Linen Project hologram at New York Hall of Science public display of Wonders of the Bible. Holographic image reconstructed utilizing a narrow band amber LED point source. (above): Students holding and examining a full-sized replica of the Shroud of Turin at one of my Wonders of the Bible exhibits / presentations. There are many theories on how the image came about. They range from a simple painting by an unknown artist, to radiation of extraordinary power (in the trillions of watts). Everyone has either a theory that they subscribe to, or a theory of their own. I was fully prepared to simply adopt an already-existing theory. This was not to be. As fate would have it, my 35+ years working with lasers and holography caused me to ponder yet another possibility. I present my views on this at the close of each presentation. 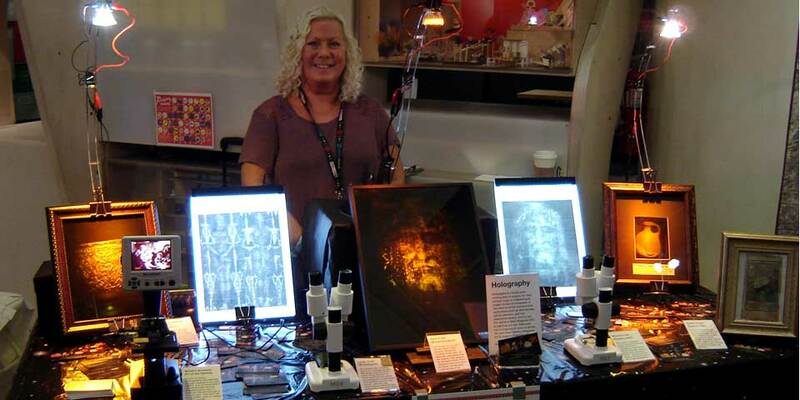 UPDATE: The Shroud of Turin fabric hologram was featured in an invited presentation to the New York Microscopical Society in October 2017.